Welcome to paradise. 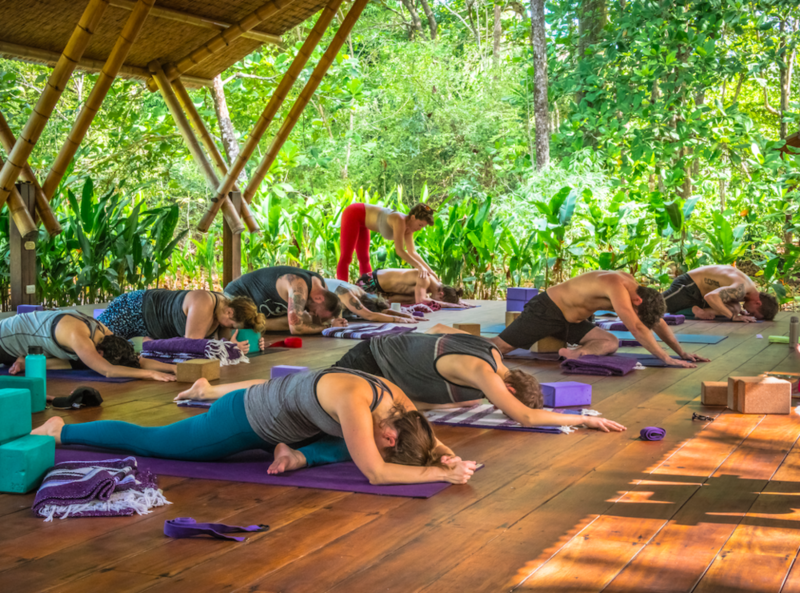 The Jungle Renewal Retreat is a week long rejuvenative experience crafted especially for those who need a respite from the busyness of everyday life so they can connect back to what makes them feel alive. This trip is created to nourish the body, the mind, and the heart. Set in one of the most naturally beautiful places in the world- our retreat center is nestled in the jungle right on the ocean. Each meal is prepared by local chefs focusing on the abundant organic produce native to Osa, Costa Rica. There will be daily yoga practices to cultivate a loving relationship with the body, stillness in the mind, and a deeper connection to the heart. In addition to 1-2 yoga classes a day, there will be specialized workshops on: Tai Chi, Patanjai's Yoga Sturas, and Cultivating Self-Compassion. For those who want adventure, there will be jungle hikes, surfing, tree climbing, waterfall rappelling, and more. For those who want a more restorative trip there are hours to spend relaxing in the sun, getting a local plant inspired body treatment, or listening to the waves during an outdoor, magical massage. Of course, you are welcome to mix and match to customize your healing experience. We have created this special week in such an inspiring place to nurture your spirit and enliven your soul. Come play with us! Look at all of our accommodations and reserve your spot here. Javanne is a psychotherapist, self-compassion teacher, and yoga instructor based in Venice, CA. As much of her family was lost in the Holocaust, she was exposed to the impact of trauma from an early age. Knowing her family’s experience, suffering, and healing impacted her greatly throughout her development. From a young age she felt called to a path of social justice and helping others restore after painful events. 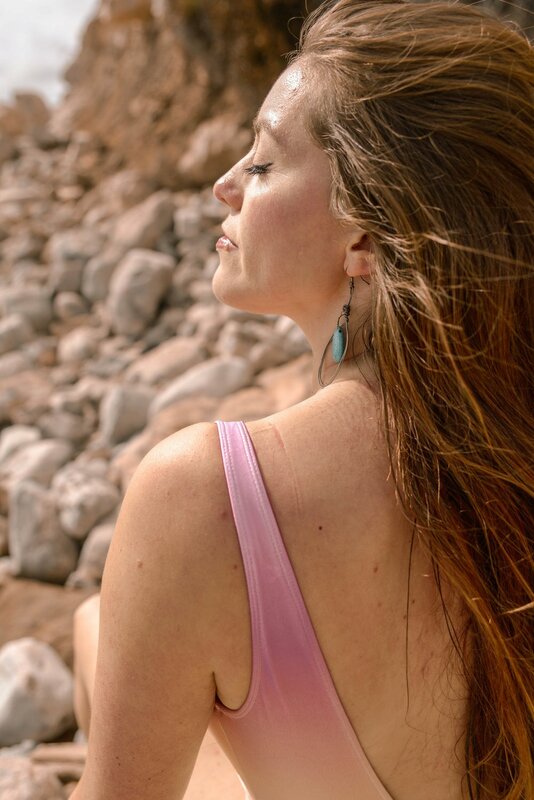 She found her way to psychotherapy and yoga through a yearning for intimacy and deep connection. Being a yoga instructor and psychotherapist is a deeply fulfilling role that allows her to journey with others down their path to wholeness. Her goal as a healer is always to help her students and clients to be able to harness their own power and find what they need within to manifest they life they desire. I have been practicing yoga since I first discovered its extraordinary benefits in India forty-five years ago. For the past fifteen years, I have taught yoga at my studio in Napa and at Sonoma Ashram where I am a member. I am a Yoga Alliance certified instructor (RYT - 200). 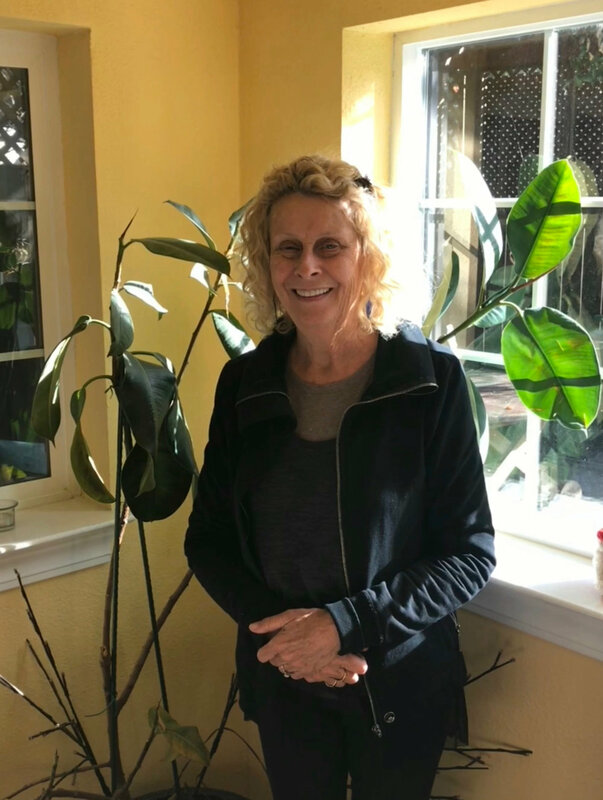 I have studied with several schools of yoga, notably Iyengar Yoga in Paris, Raja Yoga from the Kailas School of Yoga in Padua, Italy, and Anusara Yoga in the Bay Area. I am a long-time meditator and a strong believer in the power of meditation to calm and train the mind. I studied meditation with Swami Veda Bharati of the Himalayan Yoga Meditation Society and with Baba Harihar Ramji, the founder of a meditation school in Sonoma, California, and an orphanage in Varanasi, India. My goal in teaching yoga is to help students to develop greater physical and emotional flexibility and a profound awareness of their inner potential. I believe yoga can help us develop the stillness and equanimity that allows us to experience life with greater appreciation and a deeper sense of purpose. Yoga can elevate the spirit. In my yoga classes I strive to achieve these goals by combining slow yoga flows with sustained poses, interspersed with brief rest periods and contemplative practices. I address all aspects of traditional Hatha Yoga in my practice, including physical poses, breathing practices and meditation, and the study of spiritual and inspirational texts in order to provide a complete and satisfying yoga experience. I trust that our Jungle Renewal Retreat will rejuvenate your body and mind, and nurture your spirit. The Osa Peninsula is the most beautiful and untouched part of Costa Rica. The magic of the land, and the remoteness of the Boca Sombrero provides you with an unparalleled experience to unplug from your busy life and plug-in to restoration. Cradled between the rainforest and ocean, Boca is truly a gem tucked away from the rest of the world. From the calm, warm, inviting ocean steps away from the accommodations, to the lush grounds teeming with wildlife, we knew it was the right place to nurture the precious souls on our retreat. The staff at Boca feels like family and truly cares about the well-being of each guest and the food is some of the best we have ever had- local, fresh, creative, and inspired. Boca's highly trained chefs and kitchen staff provide an exotic blend of delicious and healthy cuisine that is sourced from local farmers. Their chefs take great pride in creating nutritious and fantastically tasting dishes, meeting your group’s dietary requirements, in a beautiful setting. In Boca Sombrero they are dedicated to making your stay with them as exciting, pleasurable, and healthful as possible. These charming, small, wood and bamboo structures can accommodate 1 – 2 people. Each structure has an 8 x 8 square foot tent on a platform with a covered porch with two soft bench seats for relaxing. The porch is equipped with a light. Here you share your toilet and sink with others in cabinas (three tents max per toilet and sink). Each cabina has its own private shower. The toilet and sink is a short walk from your tent (~15 yards). The platforms were designed to immerse you in the jungle and provide you with privacy. Each cabina has two comfortable, twin bed mattresses supplied with fresh cotton linens. All tents have two small (6 inch) fans, and are 100% bug proof. Shared Room in Beautiful, Open Air House - ONE SPOT LEFT! Surrounded by a lush jungle landscape and featuring a tile inlaid pool, this beautiful structure is the ultimate private getaway. The house is ideal for couples, small families, or an intimate group of friends. The spacious upstairs bedroom offers a breathtaking view of the ocean and the natural beauty of Boca Sombrero. You will be sharing this room with up to 3 other people. It is large and open. You will have your own bed with netting. 1 large open bedroom with balcony, this room will be shared with another guest/s..
Casa Troya has unique architecture and artistic flair. This incredibly beautiful bamboo and thatch-roof structure was designed and built in 2009 by German artist Marc Hübner. The house has a large bedroom the second floor that can be occupied by 2-4 people. If two people would like the house to themselves it is $2,500 per person. The room can be split by a tall partition if 3 or more people would like to share the space. That option is $2,100 per person. The kitchen is located in the center of the ground floor living area. Casa Troya is the closest of our three villas to the surf beach. The room can have 1 king bed for a couple, 2 king beds for two couples, or several smaller beds for a friend group. English/German/Spanish speaking managers Monika and Walter, on site. What can I expect on this retreat? Expect to explore yourself and the jungle on a deep and intimate level. Expect to be nourished by the leaders and other healers who have crafted this delicious experience with wisdom, authenticity, and intuition for every participant to enjoy the entire week fully. I don't do yoga, is this right for me? Absolutely!! We are all beginners! Even the most experienced teacher is constantly taking the seat of the student to continue to learn more and grow. Your guides are highly skilled at delivering an all levels experience that will be rejuvenating and refreshing. YES! There is a bit of magic that comes alive when you take the leap to venture out into the jungle to explore the innermost wisdom of your spirit. Deep work and connection can be done with a partner or friend, but having time for yourself will have its own magic as well. I have dietary restrictions. Will I have enough to eat? Absolutely. For every meal there will be an abundance of food for omnivores, vegans, and those with a gluten-intolerance. If you have any allergies, you can let us know and we will alert the kitchen prior to your arrival. What will cost extra on this trip? A packing list will be sent to you once you register for the trip. The weather is usually sunny and in the 80s with a lovely breeze from the ocean and occasional short bursts of rain to refresh the climate. You will need to fly into San Jose Airport in Costa Rica. From there we recommend booking a smaller plane through one of the Costa Rican Airlines to get to Puerto Jimenez. Sansa is a domestic carrier in Costa Rica that flies between SJO and Puerto Jimenez. It is in the same area as the international terminal you will fly into. You can take a taxi from San Jose, and that option can be discussed, but it will take about 5 hours in the taxi, so taking a quick 45 minute flight is the preferred option for your comfort. We will book taxis for you to get from the airport to the retreat center from Puerto Jimenez upon your arrival as well as for your departure. If cancellation takes place more than 60 days prior to your departure date any payments made will be refunded minus a $500 deposit. If cancellation takes place between 30-60 days prior to your departure, 50% of the trip price will be refunded. If cancellation takes place less than 30 days prior to your departure date, 100% of the trip price will be forfeited. No problem! Contact Javametta@gmail.com with any questions you have.